The per capita consumption of sheep meat (lamb and mutton) in the United States is less than one pound per person. Americans (or immigrants) of Northern European descent traditionally do not consume much lamb; however, lamb holds a significant meaning in the observances of many religions and is a dietary staple in many countries. In the U.S., the largest consumers of lamb are Middle Easterners, Greeks, and Hispanics. Population demographics and immigration patterns favor an increase in demand for lamb and goat. 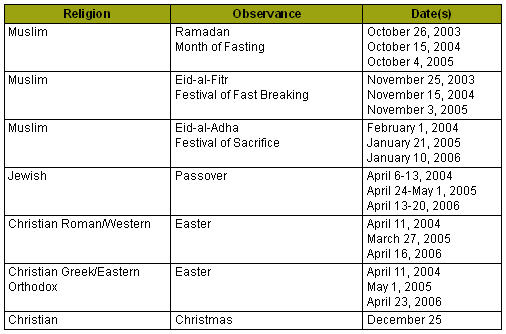 Muslim holidays occur 10 to 11 days earlier each year and cannot be predicted with exact certainty because they are based on a lunar calendar and the sighting of the moon. Eastern (Greek) and Western (Roman) Easter use different calendars (Julian vs. Gregorian) and rarely occur on the same date. In addition to the holidays listed above, the demand for sheep and lamb may increase prior to other ethnic observances. It is common for Muslims to consume sheep (or goat) meat to celebrate a new baby. There are many ways that sheep producers can tap the ethnic/religious markets for lamb. Producers may direct market their lambs to ethnic customers, take their lambs to local or regional livestock auctions prior to holidays, sell to middlemen who supply the ethnic/religious trade(s), and/or work cooperatively with other producers to market live animals or carcasses to ethnic markets. Producers should choose a target market and produce and market lambs in a manner that is consistent with the religion, beliefs, and customs of the customers. It may require changes in breeding and management to meet the needs of the ethnic market. The following tables contrast the different methods of marketing sheep and lambs, with the ethnic consumer in mind. The easiest way to sell lambs and sheep is to take them to a local or regional livestock auction. Producers can take advantage of the ethnic/religious demand for lamb when they sell to livestock auction markets, if they produce the type of lamb(s) that the ethnic buyers want and sell their lambs prior to the religious observances in which lamb is consumed. Many auction barns offer “special sales” of lambs and kids prior to Easter, Christmas, and the major Muslim holidays. To maximize returns from public livestock auctions, a producer should develop a working relationship with the market manager. To start with, let him know when you are bringing a load of lambs to market. Ask the market manager what kind of lambs (or sheep) his buyers prefer and when the best time to sell is. You can also use public livestock auctions to make contact with lamb buyers and to negotiate direct sales to packers and other middlemen. Producers should compare livestock auction markets and choose the markets that will return the most profit. Auction prices are listed in newspapers, farm periodicals, and on the Internet. When comparing the prices from livestock markets, it is important to compare “net” proceeds, rather than “gross” reported prices. The auction that brings the highest prices may not result in the most profit if the higher prices are offset by higher transportation costs, shrink, sales commissions, etc. The difference in prices between auction markets should reflect regional differences in transportation costs. Prices will be higher the closer the market is to the point of slaughter. Because you are eliminating all of the middlemen, the best price is usually obtained when lambs are sold directly from the farm to the consumer. Under this scenario, the buyer may take the live lamb with him, have the lamb slaughtered at a custom processing plant, or process the lamb on the farm. It is illegal to slaughter a lamb on the farm for the purpose of sale. Lamb meat may only be sold if the lamb has been processed in a USDA inspected slaughter plant (some states have state meat inspection which allows the sale of meat within the state). When selling lambs for slaughter, you need to sell a LIVE lamb and let the buyer process the lamb or facilitate the slaughter of the lamb at a custom or USDA slaughterhouse. You must not help the buyer process the lamb; however, you have an obligation to ensure that the lamb is handled and killed in a humane manner (lambs should not be hung until they are insensible) and that offal is disposed of in an environmentally sound manner (e.g. composting). Cornell University has published a poster depicting humane on-farm slaughter. Producers should familiarize themselves with local, state, and federal laws before allowing on-farm slaughter of lambs. Many producers do not want to sell lambs directly from their farm. Nor do they like the uncertainty of taking lambs to the auction. Selling to “middlemen” may be the best option, if you are certain you are getting a fair price. There are various middlemen that purchase sheep and lambs: Dealers (or traders) buy and sell lambs to make a profit on price and weight differences. Brokers or order buyers buy lambs (for a fee) for feeders, live markets, and slaughter houses. Packers buy live lambs, process them, and sell meat wholesale or retail. Retail markets sell to the end consumer. Ask buyers, dealers, and producers at local and regional auction markets. Contact your local packers and stockyards office to obtain a list of processors. Contact USDA or your state department of agriculture for a list of USDA-inspected and custom slaughter houses. Visit restaurants that serve lamb. Visit stores that sell lamb. Look at meat marketing listings in the Yellow Pages. When selling lambs to middlemen, there are many things to consider. For example, will you sell a live lamb or a lamb carcass? Will the buyer pick up the lambs or will you deliver them? Who will pay for the cost of transportation, including shrink. Sometimes a pencil shrink will need to be negotiated. You will need to agree upon a method of payment. There is considerably more financial risk when selling to an individual buyer as compared to selling lambs at a bonded livestock auction or to a bonded livestock dealer. You need to protect yourself from payment forfeitures and bad checks. Bank transfers prior to the sale of lambs are recommended. Good records should be kept on financial transactions. Many producers wish to sell lambs directly to the packer because it streamlines the marketing chain and should result in higher prices (when averaged over the long run). When selling lambs directly to a packer, you need to negotiate a deal (or contract) that is beneficial for both parties. The packer wants a guaranteed supply at a consistent price, whereas the producer is looking for price stability and the opportunity to forward price his product. While small producers may be able to sell a few lambs to custom slaughter houses or small butcher shops, most processors will want a regular supply of lambs and this may require several producers to work together or form a marketing pool or cooperative. Producers can have more clout in the market place if they organize marketing cooperatives or informal marketing groups. This is because unless a producer is very large, it usually takes many producers to supply a market on a regular basis. Marketing groups can be as simple as lamb pools and sharing transportation costs to legally organized cooperatives that market their own branded meat products. Numerous public grants are available to help producer groups organize cooperatives and market value-added products. 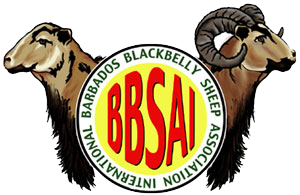 Reprinted from BBSAI Newsletter, April, 2004. Copyright 2004 BBSAI. All rights reserved.